Bushmeat hunting is defined as the harvesting of wild animals in tropical and subtropical forests for food and non-food purposes, including medicinal use (CBD, 2009). Of the many threats that forest wildlife faces, none has had a more severe impact than the unsustainable and often illegal hunting and trapping for commercial trade in wildlife and wildlife products, including the pet trade, across the developing world. As a result of this faunal depletion, the remaining tropical and subtropical forests are increasingly becoming empty of large vertebrates (“empty forest syndrome”). In Central Africa, an estimated 579 million forest mammals are consumed annually – up to 5 million tonnes of dressed bushmeat. In East and Southeast Asia, the severity of the problem is related to high human population densities, a long tradition of consuming wildlife products for medicinal use and the exceedingly rapid economic growth. Commercial wildlife trade also poses a threat to wildlife populations beyond the tropics, for example in Mongolia’s temperate steppes and woodlands – mainly for the large Chinese market. Even in remote and protected areas, the commercial bushmeat trade driven by markets hundreds of kilometres away threatens the survival of not only the wildlife, but also the indigenous and local populations which depend on sustainable hunting for their subsistence and livelihoods. The bushmeat trade is often facilitated by logging activities, because logging roads provide easy access to increasingly remote forests and logging trucks are used for transporting bushmeat. 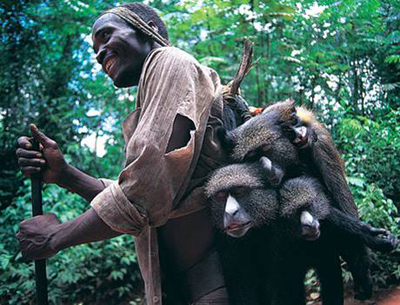 Moreover, logging companies often regard bushmeat as a free food supply which relieves them of the responsibility to provide for their labourers. FAO has established strong partnerships with governments and national, regional and inter­national organizations and networks, in particular in Central Africa, to address this critical situation and to search for viable options that will ensure the conservation and sustainable use of the extraordinary wildlife resources while improving the economic perspectives of the poor rural populations. In this context, a regional GEF project has been prepared for Gabon, the Republic of Congo, Democratic Republic of Congo, and Central African Republic on the sustainable use of selected bushmeat species. The project aims to demonstrate in pilot sites that community-based conservation and management of wildlife can be a viable and most effective strategy for conserving the integrity of wildlife, forest ecosystems and biodiversity in the Congo Basin.